This category covers establishments engaged primarily in the furnishing of terminal facilities for rail passenger or freight traffic for line-haul service and in the movement of railroad cars between terminal yards, industrial sidings, and other local sites. Terminal companies do not necessarily operate any vehicles themselves, but they may operate the stations and terminals. Lessors of railway property are classified in SIC 6517: Lessors of Railroad Property. The roughly 3,000 stations and track terminals in the United States during the 2000s served about 15 large freight railroads and more than 600 small, regional railroads. As mass transit systems continued to spread across America, rail tracks and terminals shared by more than one railroad company became an increasing concern. A train going just 30 mph needs two-thirds of a mile to stop; a train going 50 mph needs 1.5 miles. High-speed trains traveling in excess of 125 mph also were being placed into the rail system. The human error factor, which accounted for the majority of train switching accidents, was being eliminated from the industry. As trains became more electronically controlled, safety for passenger and freight cargo rose dramatically. Approximately 80 percent of railroad tracks in the United States used a technology employing electromechanical relay signal systems. However, wireless microprocessors that used computer signals were rapidly replacing the relay systems. The remote control technology was touted by proponents as a way to reduce miscommunication and the accidents resulting from human error. Switching to remote control was expected to save the industry upwards of $250 million annually, and the technology was able to be upgraded continually. The result was a less expensive and more safety-oriented rail system that was expected to grow through 2006. According to Florida East Coast Railway President and CEO John McPherson, quoted in Railway Age, the technology was "the most productive implementation in our industry since we were able to eliminate the caboose." Railroad switching and terminal establishments for line-haul railroads are connection points facilitating the movement of tons of goods on and off trains, as well as the assembly and tracking of those trains. Closely tied to the railroads' increased profitability in the 1990s was tighter scheduling and dispatching made possible by high-tech tracking systems that aided crews in train turnover, which can reach hundreds of trains a day. In order to cut costs and attract new truck-to-rail business, railroad companies have begun to upgrade their transfer terminals. At the heart of this activity was a desire to facilitate the movement of intermodal traffic. In 1997 Illinois Central upgraded its transfer terminal at Harvey outside of Chicago to increase its intermodal business. Norfolk International Terminals constructed a new intermodal transfer container facility to increase the facility's intermodal rail handling capacity. With the merger of major railroad companies in the United States, railroad executives anticipate a potential bottleneck at terminals with some railroads not having easy access to switching. In 1997 the issue became heated with the potential of some form of re-regulation coming to the industry. The biggest technological advance affecting railroad terminals was the use of computer networking and scheduling to speed jobs that were once handled by paperwork and tracked by human operators. These advances, which in the long run save money for railroads and make them able to compete with other forms of transportation, have shaken up the industry and reduced the number of workers necessary for a task. Automatic Train Control System (ATCS) networks, used by most Class 1 (large railroad) lines, are based on transponders attached to tracks at certain intervals and triggered by passing trains. With ATCS, information gained from the transponders is sent via fiber-optic cable or telephone line to a regional data center or directly to the switching yard to which a passing train is headed. Once gathered, this information allows switching establishments to react more quickly to changes on the line, as well as to assign incoming trains to certain tracks in the yard. Switching establishments, which may or may not be run by the railroads that use them, can use up to 100 track segments on which cars and locomotives are coupled and uncoupled, loaded and unloaded. ATCS was being implemented in four areas: work order reporting, locomotive performance monitoring, track force equipment management, and positive train separation and control. The U.S. Department of Transportation's (DOT) Federal Railroad Administration (FRA), in cooperation with the industry, conducted a safety inquiry into this new technology and reported to Congress the feasibility of implementing ATCS in a way that would enhance the safety, efficiency, productivity, and customer service capabilities in the railroad industry. Union Pacific's rail complex in North Platte, Nebraska, the world's largest, can deal with up to 700 trains in a day by way of its computerized command center. Outside Albany, New York, Conrail's Selkirk Yard sorts 3,200 freight cars per day, thanks to computer scheduling and track assignment. Finally, a move by the railroads to a hub-and-spoke system of organization reduces local stops and focuses time and money on larger, more centralized switching establishments (see SIC 4011: Railroads, Line-Haul Operating ). To meet the new demand, corollary industries also were experiencing commensurate growth. For example, Harmon Industries, manufacturer of signaling and safety systems, posted a record $265 million in sales for 1998. The company offered a six-week training program to train switch operators in crisis situations, which are simulated in its 3,500-square-foot lab, complete with two full-size switching machines and three railroad crossing gates. Another corollary industry was that of renovating and refurbishing train stations that service switching terminals. The nonprofit Great American Train Foundation published its first "Guidebook on Train Station Revitalization" in 1999 to assist local governments and communities in transforming railroad stations into multimodal centers of transportation, commerce, and economic development. Interest in passenger rail continues to grow, with both intercity and rapid transit applications. The Congressional fiscal year 2000 budget for the federal transit program was $5.8 billion, with the passenger railcarbuilding industry being a key beneficiary. The Surface Transportation Board Reauthorization Act of 2003, introduced to Congress by the DOT on July 10 of that year, was intended to authorize appropriations for the Surface Transportation Board (which replaced the Interstate Commerce Commission) from $20.5 million in 2004 to $23.5 million in 2008. A key provision of the act, when it was reauthorized four years before as the Surface Transportation Board Reauthorization Act of 1999, was the mandate calling for reciprocal switching in railroad terminal areas, enhancing competition among terminal providers. The remote control technology was not foolproof, however. In 2002, Atlanta experienced three collisions with remote controlled engines in only eight months. The third collision derailed five cars, three of them filled with cement. Those in the Brotherhood of Locomotive Engineers, a railway worker's union, claimed the collision would not have occurred under the oversight of a human engineer. Although labor unions fought against radio remote control technology in the 2000s due to its impact on jobs, it was coming into widespread use by 2002. Engineers had begun to cease fighting a losing battle against the inevitable, and started training to work with the technology. While there were still documented cases of collisions due to equipment failures, the number caused by human error declined. In addition, switching to remote control was expected to save the industry upwards of $250 million annually. The technology was expected to completely pay for itself in a very short time. Rather than eventually become obsolete itself, radio remote control technology was able to be continually upgraded. In the 2000s, the government also was putting money into research and development of technologies, through such programs as IDEA. 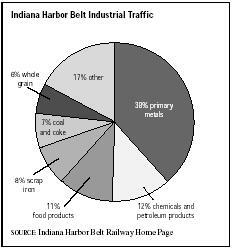 Indiana Harbor Belt Railroad Co. of Hammond, Indiana, led the industry with 2001 revenues of $88 million and 800 employees. Belt Railway Company of Chicago, based in Bedford Park, Illinois, was second with $78 million in revenues and 600 employees. In third place was Missouri-based Terminal Railroad Association of St. Louis, with $36 million in revenues and 300 employees. Other industry leaders were Cuyahoga Valley Railway Company of Peninsula, Ohio, with $19 million in revenues and 200 employees, and New York-based South Buffalo Railway Co., with $13 million in revenues and 100 employees. Railroad terminals use a hierarchical employment structure much like that found in the larger railroad industry, in which engineers, conductors, and brake operators work together on operations. In the terminals, however, job descriptions are slightly different. Railyard engineers oversee the movement of cars within the freight yard or terminal and the assembly of trains. Yard conductors oversee all yard employees, instructing them in assembling and disassembling trains and switching cars between tracks. Yard brakers (or "yard helpers") assist the conductor and do much of the physical labor of coupling and uncoupling cars. In addition to the yard crew, railroad terminals employ clerks, maintenance workers, and signalers and signal maintainers. Passenger terminals also employ station agents and ticket agents, who deal directly with the public. Because of continued automation, the industry was expected to lose employees, declining to 143,000 by 2006. This represents a drop of approximately 24 percent from 1995. "About the Indiana Harbor Belt Railway." 8 March 2004. Available from http://www.ihbrr.com . Baker, Deborah J., ed. Ward's Business Directory of US Private and Public Companies. Detroit, MI: Thomson Gale, 2003. "Five Cars Derail at Atlanta CSX Train-Switching Yard." Knight Ridder/Tribune Business News, 10 August 2002. Hoover's Company Fact Sheet. "Indiana Harbor Belt Railroad Company." 3 March 2004. Available from http://www.hoovers.com . Peirce, Neal. "Reviving Cities and Rail Stations: As Imperiled as Amtrak." Nation's Cities Weekly, 1 July 2002. Petit, Bill. "A Delicate Balance." Railway Age, May 2002. "Surface Transportation Board Reauthorization Act of 2003." 8 March 2004. Available from http://www.theorator.com/bills108/s1389.html . Ytuarte, Christopher. "Coming to Your Class I: Remote Control." Railway Age, February 2002.